No two are exactly alike as the glazing process creates different crystal patterns on each piece. Each piece is bisque fired before the glaze is applied and high fired to Orton, cone 11, above 2350 F.
Available is a large ceramic free form raku bowl with uneven, torn top walls, featuring several abstract charcoal markings. The torn edges of the top are either filled in with glaze or covered with smoke, and many of the raku crackle veins originate from this top edge. Lawson Rudge Raku Pottery. Lawson Ernest Rudge - A large raku glazed studio pottery model of a ram. The tip of one horn has previously been re-stuck and there are two nibbles to the front left foot. WONDERFUL STUDIO POTTERY VASE JAR SIGNED ROUSH MID CENTURY? Glazed Clay Pottery Vase approximately 6 1/4" Tall Signed by Artist SKW 1982 Cobalt Blue RARE. Excellent condition. Shipped with USPS Priority Mail. Stephen Pearce pottery. Fresh to Market from local estate. This listing is for a pretty Arts & Crafts style green studio pottery vase. Artist signed on bottom - see photo. Approximately 6" high x 3" wide at base. Check listings for more Studio Pottery. Condition: Excellent condition with no chips or cracks. There are 3 teeny mfg glaze pops. See photos. Shipping Weight: 3 pounds US Shipping: We pack defensively. Buyer to pay USPS from zip code 92027. Parcel Post is less expensive, but can take up to 15 days from West Coast. The beautiful artisan glazes were all developed over 30 years by Neville Porteous. Tiles are individually made using hand made moulds and are all hand painted. The final product is a tile of exceptionally high quality, with a beautiful lively individuality. It is a lovely hand etched and hand painted t eepee pot depicting elegant designs. 1 1/2" Opening. A wonderful little pottery bowl made at Eastfield Village, East Nassau New York ca 1995. This small London shape bowl is a faithful reproduction of a early 19th century original. While Don specialized in mochaware primarily, Denise focused on painted pearlware. Artist signed as shown. No exceptions! 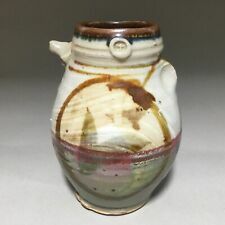 Gorgeous piece of art pottery - fantastic shape and coloring! Signed on the bottom "MB". Overall in good displaying condition. A wonderful addition to your collection! Glazed stoneware. Rock style vase for dried flowers. Has foam in the bottom. Light wear consistent with age. Local pickup available in Riverside, CA . For sale - a beautiful, early David Frith oxidised stoneware plate in perfect condition. David Frith is one of the most respected of Britain's active potters. Born in 1943 in Lancashire, he trained at Flintshire Technical College, Wimbledon School of Art and Stoke on Trent College of Art. It measures roughly 175mmacross and roughly 20mm deep, it weighs in at roughly 465g. Thank you for looking. Well, well, what have we here?. Mix it, match it, throw it in your basket! A handling fee per item still applies (see tedious and preachy explanation above). This wonderful piece measures 8.5” across including the handles and 5” tall. The glaze is beautiful and vibrant. No chips or cracks. Please check out the pictures for full description and email me with any questions, thank you! Beautiful Gravy Bowl with Ladle & Plate. Ladle is 6 1/4" long. 2 nice handthrown nesting bowls. Floral and butterflies adorn this lively pattern. 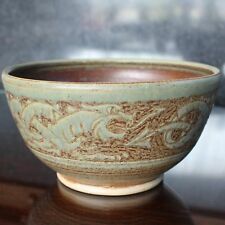 Minor maker's characteristics are present in the decoration and glaze - white rubs, speckles, etc. Shiny and fresh surfaces - looks unused! Large Pottery Vase featuring a lily pad and frogs. The lily pad is wrapped into the vase and the frogs adorn the sides. Even has a lily pad flower. Finely detailed. Stunning piece! Beautiful green colors. Large Moroccan Glazed Pottery Bowl Cobalt Blue/ Copper Trim in very good condition. This bowl has 2 holes in the back for hanging. Versatile decorative bowl can be used on the wall or as a center piece. Studio pottery figurine by Marie Whitby, of Seven Springs Pottery, Ashwell, Herts. Sandrouni Armenian Handcrafted Tile of Western Wall, Jerusalem --4" X 8"
25 year-old Sandrouni Armenian tile. Scene of Western Wall in Jerusalem. Impressed mark to its base. Mid-Century Signed Arno Scheiding Bowl. Russel Wright Style. Condition: Excellent. We will respond and do whatever it takes to make certain that you feel you were a WINNER. Impressed with ST & WP Seals.